Located right on the edge of Lake Garda in Italy, Cisano San Vito is a campers paradise and promises glorious weather during the summer months. Consisting of two separate luxury camping sites that are connected by a pedestrian walkway, each site offers breathtaking scenery, exciting activities and a decent selection of accommodation options. Stay in a luxurious mobile home or holiday home for an indulgent camping experience or opt for a fully-equipped apartment. 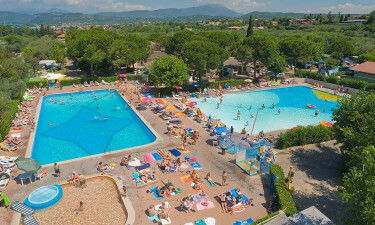 Regardless of your choice, you can rest assured that when booking a camping holiday to Cisano San Vito with LUX-camp, you will be giving your family a holiday to remember. Why go to Cisano San Vito? Whilst the Cisano campsite offers an active, fun-packed atmosphere, San Vito is much quieter and provides holiday-makers with many relaxing ways to enjoy their vacation. Cisano San Vito as a whole complex boasts a beautiful beach on the banks of the lake, a lagoon pool, thermal baths and a sauna that are all perfect for a break away from the hectic environment around the outdoor pool and sporting areas. Cisano San Vito is more than just a campsite for many different reasons. Aside form the luxury accommodations and on-site amenities, this fantastic resort has something for everyone to enjoy. With entertainment throughout the day including games, competitions and evening discos, a large 3-pool swimming complex that also boasts both a water slide and a separate pool for toddlers, there is no chance that your little ones will get bored. Please note: The pool area in Cisano is open from 26/4 until 20/9 and the pool area in San Vito is open from 1/6-7/9. As the stunning Venetian ports of Bardolino and Lazise are within walking distance, there are plenty of opportunities to indulge in a bit of local exploration. For a fun-packed camping holiday that will be unforgettable, there is no better choice than Cisano San Vito. With an extensive range of sporting activities to choose from including tennis, football, riding, archery, cycling, volleyball and golf, both children and adults will find it very easy to keep active during their visit. 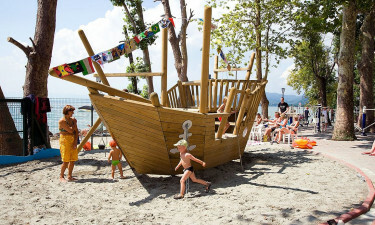 As this campsite is located along the edge of Lake Garda, there are various water-sports to try out such as sailing, surfing and canoeing and fishing is also a very popular pastime. With this much on offer it is little wonder why Cisano San Vito comes so highly recommended. Cisano San Vito has several food and snack outlets on-site including a pizzeria and an ice-cream shop. 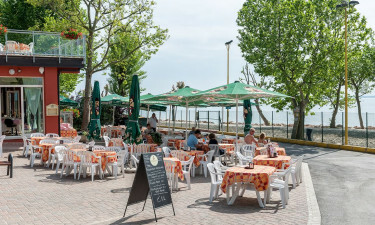 With a waterside restaurant offering a spectacular menu, a bar that is ideal for an entertaining evening out and a takeaway service which is great for a quiet night in, there is a fabulous choice when it comes to food and beverages. With several grocery stores and a supermarket within the grounds of this luxury camping resort, campers can keep stocked up with fruit, vegetables, fresh bread and personal items at all times. There is also a souvenir shop on-site.